Global fish production reached a total of 171 million tonnes in 2016, about half of which was farmed, according to the FAO. 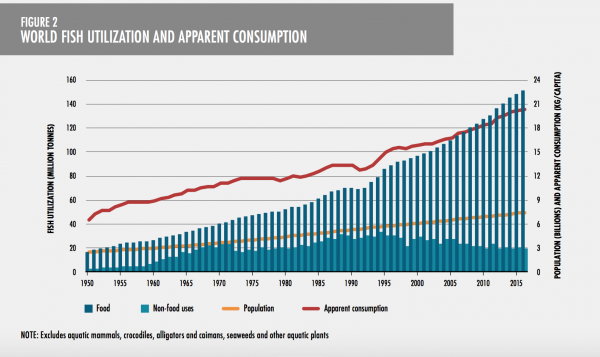 The capture of wild fish has stagnated since the late 1980s, and aquaculture accounts for the subsequent increase in fish production. Aquaculture raises its own waste and sustainability concerns, noted Gustavsson, “Aquaculture is far from being the magic bullet, as it is often unsustainable. Using 20m tonnes of fish like mackerel, sardines and anchovies to feed farmed fish instead of people is a blatant waste of food.” It has also distorted world fish markets; with farmed salmon ubiquitous on restaurant menus, for example, side-by-side with local fish, as I’ve noticed in my own travels, throughout Asia in particular.. Since 1961 the annual global growth in fish consumption has been twice as high as population growth, demonstrating that the fisheries sector is crucial in meeting the FAO’s goal of a world without hunger and malnutrition,” noted José Graziano da Silva, FAO director general. 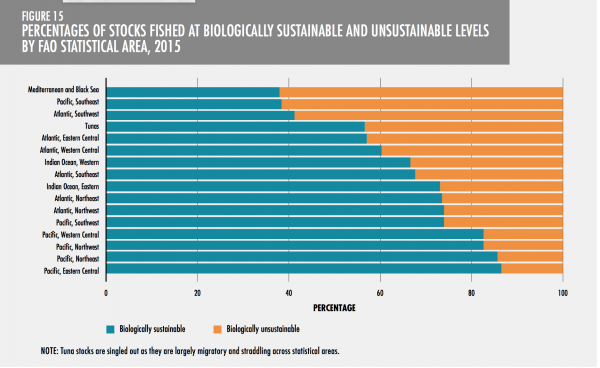 Based on FAO’s monitoring of assessed stocks, the fraction of fish stocks that are within biologically sustainable levels has exhibited a decreasing trend from 90.0 percent in 1974 to 66.9 percent in 2015. 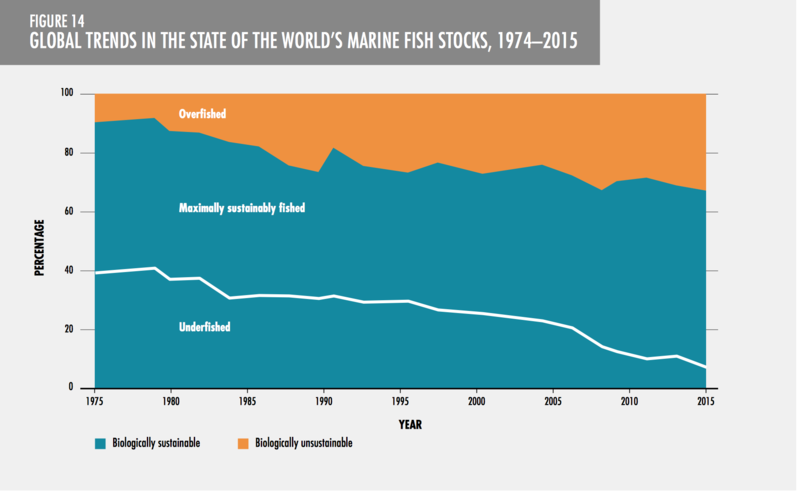 In contrast, the percentage of stocks fished at biologically unsustainable levels increased from 10 percent in 1974 to 33.1 percent in 2015, with the largest increases in the late 1970s and 1980s (FAO Report, pp. 39-40, citations omitted). Source: UN FAO, The State of the World’s Fisheries (2018), p. 40. This sustainability problem varies heavily by region, with the Mediterranean and the Black Sea in 2015 having the highest percentage (62.2 percent) of unsustainable stocks, followed by the Southeast Pacific (61.5 percent), and Southwest Atlantic (58.8 percent). Yet the news is not all grim, with some areas registering much lower levels of unsustainable stocks, ranging between 13 and 17 percent. Source: UN FAO, The State of the World’s Fisheries (2018), p. 41. “This steady creep upwards in overfishing must be seen as a clear warning that despite many efforts to curb this serious problem, clearly, we are not yet winning the battle,” said Michele Kuruc, head of [World Wide Fund of Nature’s (WWF)] delegation to the ongoing FAO Fisheries Committee meeting (held July 9-13). According to WWF, solutions to unsustainable and destructive fishing must include governments urgently setting aside short-term economic interests and responding instead to scientific advice on managing shared fish stocks and ecosystems with a long-term, responsible outlook; partnering with small-scale fishing communities to support sustainable fishing; ending harmful subsidies; and making further progress on tackling illegal, unreported and unregulated fishing. In addition, WWF is calling for robust action to protect important habitats like fish spawning areas, coral reefs, mangroves and seagrasses which are vital for global ocean and fisheries health. 1. Educate yourself. Not all farmed fish are bad, especially if they come from the U.S. or Canada, where the industry is more tightly regulated. Download a fish-buying guide from Seafood Watch, which is geared toward each state and will tell you which fish are the best choices, good alternatives, and important to avoid. 2. Smaller is better. Why feed small fish to the big ones, if you can eat them yourself? These tend to be richer in omega-3s and selenium. Eat at the bottom of the food chain in order to avoid chemical bioaccumulation, as well. 3. Look for unusual, U.S.-sourced species. So many great fish are exported because Americans aren’t interested in eating them; people here tend to be fixated on shrimp, salmon, and tuna, but there’s so much more out there. Expand your culinary horizons. 4. Farmed filter feeders are the best. Called the most ethical seafood, clams, mussels, and oysters don’t require feeding and don’t have the kinds of ethical concerns that other creatures do. 5. Eat local, seasonal catches. If you live near a body of water, find out what comes from there. Eat the species grown closest to home, rather than importing exotic species from the other side of the world. Join a CSF (community supported fishery) program if you can. Eat according to the season, as well. The Marine Conservation Society has a guide to seasonal fish-buying here. When I buy fish, I try to buy fresh fish buy from local fisherman. New York City’s Greenmarkets have decent options– and buying just what one needs, and looking beyond the usual suspect species, can keep costs manageable. This is my ideal and of course not always possible. So I suppose the Treehugger recommendations are a useful starting point for guiding one’s own fish consumption along a more sustainable trajectory. This entry was posted in Environment, Guest Post, Politics, Regulations and regulators on July 11, 2018 by Jerri-Lynn Scofield. It should be said that poorly designed regulation has a major role in wastage – it incentivises fishermen to throw away fish that don’t come within their quotas. Another problem of course is that fishing worldwide is heavily subsidised by governments. Banning subsidies would have an immediate and dramatic impact on reducing catches. I think a key issue in this – and I’ve no solution for this – is that the coastal and concentrated nature of the fishing industry gives fishermen a disproportionate amount of political power in many countries – you can see this factor from Norway to Spain to Japan. Japan is a case in point – the whaling industry is minuscule, but has a firm grip on Japanese politics due to the key electoral districts in the north and coastal areas. I think only hard cash will solve a problem like this – buy the boats out. The report had a section discussing how too many fisherfolk– and too many boats– are chasing too few fish. Due to lack of space, I didn’t discuss this. Yet with that in mind, your solution is spot on. I had a friend who is now deceased – self inflicted shot to the head, who when robbed of a PhD ended up working on a fishing boat based out of Alaska. His job was as a biological observer. He would count the number of endangered species, or off-season fish scooped up in the trawler net. If he reached a certain number, he would have to tell them to stop fishing, and then the boat would return. He told me everything that was sucked up would be either dumped back over the side of the boat, or ground up into cat food. Think about that when you feed a cat. Anyway, this is the mentality of capitalism. Destroy what you can to get the small amount of what you want. I only eat fish I personally catch, which is almost never, so I encourage all of you, before thinking about going out for sushi, think about a nice vegan meal or at least vegetarian somewhere. Or actions are annihilating the planet. “Think about that when you feed a cat”….or any carnivorous pet. I’m “mostly” vegan – I still have the occasional ice cream, butter, cheese – but I do buy meat/fish for my pets. I don’t know if you can feed a cat or dog a vegan diet….. I am opposed to pet ownership, on a variety of levels. I used to work with the guy who was in charge of formulating petsmart food. He said you wouldn’t feed an animal it if you knew what it was made of. City dwellers with dogs and plastic bags. Horrifying how much plastic is used for that. Sotto voce: Isotope_C14, count me as another NC-er who is opposed to pet ownership. Especially in cities. Why? Just curious. Where would all these animals go? Should we just kill them all….right now? Forget the intellectual argument and tell me what is the difference in caring for another living creature and caring for a family member – because that is how most view their pets. Give me one frigging good reason why we should not care for our fellow living beings. Do it. So you first say, “forget the intellectual argument”, and immediately talk about caring for another living creature. I do not have the ability to make an argument based on emotion, do you? You are welcome to disagree that millions of plastic bags daily hold a hunk of poop in them and then end up in landfills. You can explain to me how outdoor cats kill birds, rabbit young, and all kinds of native fauna, and that’s just fine with you. Cat litter, I’m sure there’s no carbon footprint there, and lets see what landfill that goes to. Dog food: not environmentally sound in any way shape or form. People should stop breeding all domesticated “pets”, especially the deeply inbred kinds that have crippling genetic defects. Of course, western selfish capitalists should be able to be so rich that they have pets that live in their house, better than 10% of the people in their country, and perhaps 50% better globally, because animals are cute and cuddly, and homeless people, well it’s “their” fault. You don’t actually care. If you did, you’d realize the impact of animal domestication and agriculture and come to the conclusion that we are the cause of the sixth mass extinction, having animals is NOT helping, especially “ornamental” ones. You see, a mass extinction event includes all pets and people. I’m hoping the bacteria will have a chance to survive. And how pure are you on all these fronts? Do you order coffee that has a plastic sippy cup lid? Buy veggies in a store, where you are pretty much required to use a plastic bag so your portion can be weighed? Buy take-out food, which often is packaged in plastic? You can buy cat litter made of corn. It also happens to smell better than a lot of other cat litters. So bye bye your landfill argument. And indoor cats don’t eat birds. As for pets, if you have a small pet (<30 lbs) it eats less than a human child, will live less long than a human, does not need toys. to use electricity beyond what its household uses (as in for electronic devices for school and entertainment), to be driven to school and play dates, or to take up a seat on the airplane if its humans decide to schlepp it with them. Now I can see the case against buying purebreds, since this encourages the production of more animals. But what about shelter animals? In other words, if you are going to make an ecological argument against pets, the ecological argument against children, oh, and elderly adults, is even stronger. So where do you propose to draw the line? Well, I don’t have children, pets, or use disposable plastics for my day-to-day. I don’t travel, don’t take planes, and only use public transit. I have some plants. I’m trying to take some CO2 out of the air, for all the good it will do. Here in Berlin we have plenty of no-plastic markets, very easy to reuse old plastic containers as well, if you choose to. We also have returnable-reusable glass bottles, for beer, juice, soda, and even water. Pepole often carry around a separate veggie bag so the glass bottles don’t smash the soft things. I do love that meme showing the guy in a well with his head popped out saying “But you support blah blah blah” while speaking against say, industrial capitalism. I’d opt for the Native American approach to life, rather than the wholesale destruction of the planet and all non-bacterial life on it. Unfortunately in the global capitalist system all land is “owned” by someone rich. Sorry I can’t off-grid, that isn’t allowed by the oligarchs. If your argument is “where do you draw the line” – I ask you do we let the western selfish mentality kill the planet? Or do we make the tough choices to get our population under control, and stop the endless consumerist waste? I don’t honestly think elderly adults are the problem. I think the problem is that from cradle to the grave you are taught that buying trash is freedom and that you need X dogs and a big pickup truck and a couple guns for the American dream. I see elderly folk all the time in Germany biking, and only buying what they need, and living a more sustainable existence than the vast majority of Americans. And there is an ecological argument against Children. Don’t have them. That’s the best way to save the planet. I was recently in Bermuda and saw lots of parrotfish which are quite beautiful and essential for healthy coral reefs. The locals told me that the fish population had only recently bounced back after regulations were passed limiting the catch. I got conflicting stories – one person said that the regulation stopped all the fish pots within a certain radius of the shore set out by small fisherman. Another said it was the large factory boats sweeping up everything, not the locals, that were the problem. That made more sense but I’m still not sure what caused the problem and it could be a combination of both the corporate boats and the small fishermen. In Greece years ago I heard of local small time fishermen who fished with dynamite, which obviously is far from a sustainable method. The point is simple though – the fishery was regulated, certain fishing stopped completely, and the population rebounded in a fairly short period of time. It may have done to keep the snorkeling tourists happy moreso than to help the fish, but whatever works I guess. I believe the wastefulness is due to the convenience factor that the Western world insists on. Rather than having a temporary shortage of anything, or god forbid, making people wait in line, we overproduce just about everything now and can have it delivered within hours. if it doesn’t sell, throw it out. This has to stop. So true. But I don’t know how consumers can promote seasonality when suppliers are convinced that they can make a steady profit year-round. I wouldn’t be surprised if there were some certification process out there trying to address this. I volunteered for a nonprofit one summer in Jamaica, and was invited out fishing several times with a local stonemason. We would head out to the reef (where his outboard motor would reliably go unreliable) and drop our lines in unbelievably clear water. I could peer over the side and watch the most beautiful fish (mostly) ignore our bait. I was a little unsettled at how this guy would keep anything and everything, until I understood it was all going in the pot at home to feed his family. That fishery was clearly depleted and there were people like my friend still trying to eke out a meal wherever they can find it. It was another reminder to me about how poverty creates really knotty problems in resource management. pretty much the assumption has to be that any seafood from outside the EU or US is from an unsustainable fishery. Trawler registered in lax country A >>> fishing in international waters >>> fish processed in onboard or in lax country B >>> exported to the US/EU/China, frozen or canned or as protein meal for industrial fish food/livestock feed. tragedy of the commons 21th century style. We are doing a poor job of taking care of this Earth. Love that suggestion to eat local fish. Here in Texas we are warned not to eat the fish caught in any of the rivers, lakes or streams, because of the high mercury from, oh, I dunno, emissions from coal-filed electrical plants, or something. There’s a lake in Utah (not coincidentally, named Utah Lake) where the waters have long been fouled by a nearby steel mill. It was well known that no one should consume fish from this lake. But that didn’t stop some enterprising local from trying to get a permit to harvest carp for export and consumption in China. The scheme actually got pretty far before someone in the local legislature paused to consider ethics and shut it down. Hopefully the golden rule applies to both sides of the Pacific, but that seems childlike in its naïveté. Usually they break it down by breed. Globally most fish is contaminated. Non-Asian carp, and catfish are usually on the do not eat list. Your state DNR will have local guidelines on all the other species. Smaller fish are less contaminated as well, and they tell you which it is in the guide. I suppose that if perhaps you cut back all quotas by say, 25%, then fishermen would be pressured to be more efficient with their fishing practices and not so quick to throw away so many fish. Might relieve some of the pressure on fish stocks too if the takings were reduced by 25% as well. I am not so sure if the solution is to buy up those fishing boats as they are only little guys. Instead, make illegal those huge floating fishing factories that vacuum up anything and everything. Had one of them come south a few years ago wanting to vacuum up everything in the waters south of Australia which caused a hell of a ruckus which forced it to go elsewhere. A big problem with quotas is that what happens in reality is the fishermen catch all they can, then select the most valuable from the catch in terms of size and condition to fit with their quota, then throw the rest away. So unless you have a 100% honest inspector on every boat, thats no real solution. From my reading on the topic, the only thing that will work is a combination of no-fish reserves (which fishermen often support, because these reserves boost overall fish stocks), along with boat buy-outs. Well thought out boat buy-out schemes (say, tie it to bigger pensions for older fishermen) can help fishing communities and reduce pressure on stocks. Personally I don’t like fish much, but it seams insane to me that we would have an overfishing problem when this also happens. 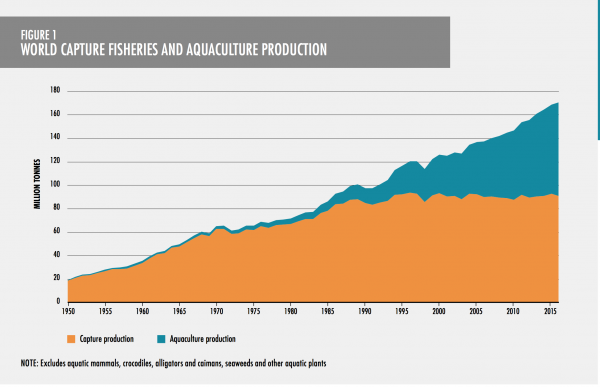 Typo: fish production is 171 million tonnes.